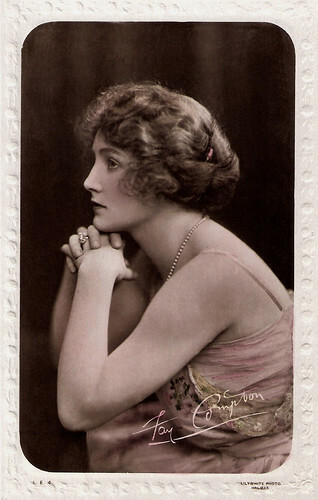 Fay Compton (1894-1978) was an English actress from a notable acting lineage. On stage she starred in the classics as well as contemporary material. Compton played Ophelia opposite two of the most celebrated Hamlets, John Barrymore and John Gielgud. She also appeared in more than forty films between 1914 and 1970. British postcard by Rotary Photo London, no. S.38-1. Photo: Rita Martin. British postcard by Rotary Photo London, no. S.38-2. Photo: Rita Martin. 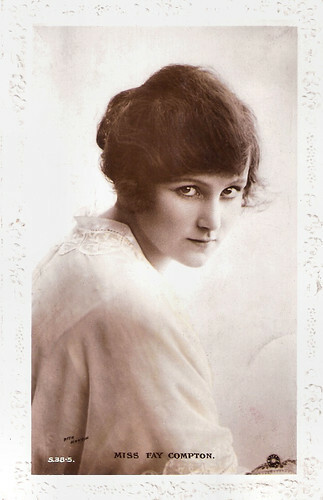 Virginia Lilian Emmeline Compton-Mackenzie was born in West Kensington, London, England, in 1894. 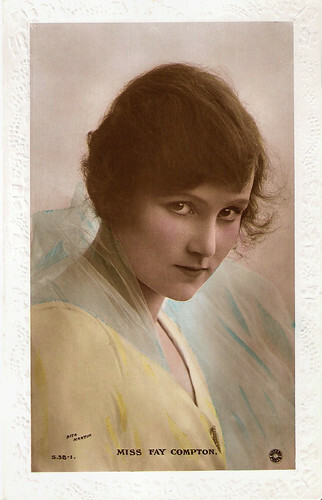 Her father was actor/manager Edward Compton; her mother, Virginia Bateman, was a distinguished member of the profession, as were her elder sister, the actress Viola Compton, and her uncles and aunts. Her grandfather was the 19th-century theatrical luminary Henry Compton. Author Compton Mackenzie was her elder brother. 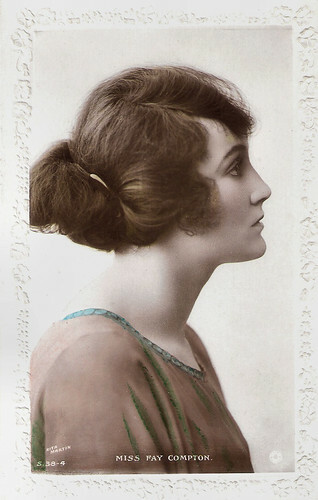 Compton made her first professional appearances between 1911 and 1913 with The Follies under the leadership of H.G. Pelissier. Although she was still a teenager, Pelissier became her first husband and she gave birth to her only child at age 17. Compton made her mark in the plays of J.M. Barrie the author of Peter Pan. She was his favourite actress. He wrote the play, Mary Rose (1920), especially for her. In 1926, she published reminiscences entitled Rosemary: Some remembrances. She was active in the classics as well as contemporary material. She starred in the original Broadway production of Ferenc Molnar's Olympia, in 1928. Her most significant successes in the 1930s were in two sophisticated comedies by Dodie Smith, Autumn Crocus and Call it a Day. In 1941, she played Ruth Condomine in the original West End production of Noel Coward’s Blithe Spirit. 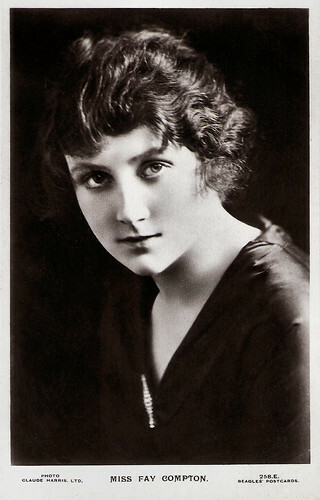 Compton had the distinction of playing Ophelia opposite two of the most celebrated Hamlets, John Barrymore and John Gielgud. In 1962 she appeared as Marya in Laurence Olivier's production of Uncle Vanya by Anton Chekhov at Chichester Festival Theatre. This production was filmed by Stuart Burge as Uncle Vanya (1963), also starring Michael Redgrave (Vanya), Laurence Olivier as Astrov, Rosemary Harris (Elena), and Joan Plowright (Sonya). She also had her own drama school Fay Compton's Studio of Dramatic Art, where one of the pupils was Alec Guinness. British postcard by Beagles, no. 258-E. Photo: Claude Harris. British postcard in the Lilywhite Photographic series, no. L.R. 4. Photo: Halifax. 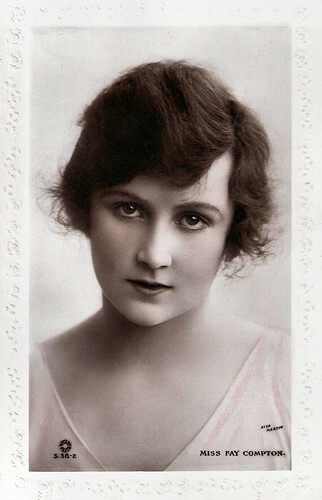 Fay Compton's film work is less known than her stage appearances. She made her film debut in the British silent historical comedy She Stoops to Conquer (George Loane Tucker, 1914) starring Henry Ainley. From 1914 on, she appeared in more than forty films till 1970. She played leading roles opposite Owen Nares in such silent films as The Labour Leader (Thomas Bentley, 1917) and One Summer's Day (Frank Goodenough Bayly, 1917). During the 1920s she starred in such silent films as Judge Not (Einar Bruun, 1920), the Oscar Wilde adaptation A Woman of No Importance (Denison Clift, 1921), and the crime film The Eleventh Commandment (George A. Cooper, 1924), with Stewart Rome and Lillian Hall-Davis. A curiosity on her resume is Michelangelo Antonioni’s I Vinti/The Vanquished (1953), an anthology film about well-off youths in France, Italy and England who commit murders. Her final film roles were in the thriller I Start Counting (David Greene, 1969) with Jenny Agutter, and as the grandmother in The Virgin and the Gypsy (Christopher Miles, 1970), based on the novella of the same name by D.H. Lawrence. Among her television performances, she appeared with Michael Hordern in the TV play Land of My Dreams (1965). One of her last major roles was as Aunt Ann in the BBC's The Forsyte Saga (1967). She also had a successful career in the radio, television and gramophone recordings. Fay Compton was married four times. In 1911 she wed H.G. Pelissier. He died two years later, aged 39. Their son was British director Anthony Pelissier, whose most significant film was The Rocking Horse Winner (1951). His daughter was actress Tracy Reed. In 1914 Fay married actor and comedian Lauri de Frece, who happened to be Jerome Kern's best man at Kern's 1910 wedding. He died in 1921. In 1922 followed Leon Quartermaine, an actor who had appeared with her in Barrie's Quality Street in 1921. They divorced in 1942. Her final husband was actor Ralph Michael, real name Ralph Champion Shotter. They divorced in 1946. Fay Compton was awarded the CBE (Commander of the Order of the British Empire) in the 1975 Queen's Birthday Honours List for her services to drama. She died in 1978, in London, aged 84. British postcard by Rotary Photo London, no. S.38-4. Photo: Rita Martin. British postcard by Rotary Photo London, no. S.38-5. Photo: Rita Martin. Sources: Hal Erickson (AllMovie), Wikipedia and IMDb.